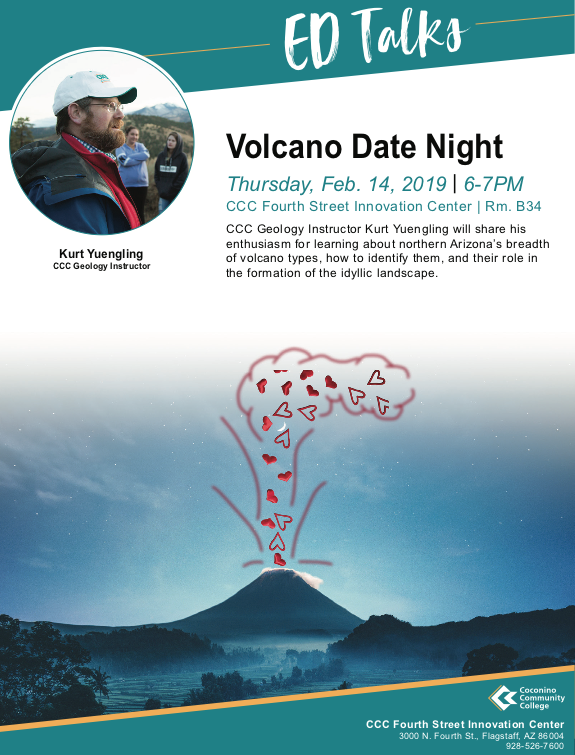 FLAGSTAFF — Coconino Community College will present “Ed Talks: Volcano Date Night,” from 6 to 7 p.m. Thursday, Feb. 14 at the CCC Fourth Street Innovation Center, Room B34. CCC Geology Instructor Kurt Yuengling will share his enthusiasm for learning about Northern Arizona’s breath of Volcano types, how to identify them, and their role in the formation of the idyllic landscape. For more information please contact, Larry Hendricks at, larry.hendricks@coconino.edu.